Dry eye, also known as keratoconjunctivitis sicca, is a condition that exists when there is poor or inefficient lubrication of the ocular surface. It is a very common problem, especially in women, affecting millions worldwide. It can be the result of one or several abnormalities affecting the surface of the eye, and ranges from mildly irritating to vision threatening. The most common sensation is that of grit or sand in the eye, or that there is something underneath the eyelid. Other symptoms include irritation, burning, redness, tearing, eyelids becoming “stuck”, or even itching. It may be strange to hear people with dry eyes complain of tearing, and this is because irritation from dryness stimulates the production of tears, but these tears do not adequately moisturize the ocular surface, and thus continue to be overproduced. Some will also complain of the lids sticking to the eye surface or crusting in the morning. Dry eye is typically the result of either low tear production or high tear clearance. A balance of elements that make up our tears help to soothe, maintain, and provide nutrients to the ocular surface. The eyelids themselves are also vital to keeping our eyes properly coated by tears and protected from harmful environmental conditions. Decreased tear production can occur on its own, or can be associated with many systemic diseases. Inflammatory diseases of the ocular surface, such as allergy, may cause irritation and increased need for moisture and nutrients. Inflammatory eyelid diseases, including blepharitis and rosacea, can lead to an imbalance of tear components, which causes them to evaporate more quickly, and irregularity in eyelid anatomy, hindering the ability to protect the eyes. Trauma, surgery, or other problems that affect the eyelids’ ability to properly close, especially at night during sleep, can cause a dangerously dry and exposed ocular environment, which can lead to severe complications. What other medical conditions are associated with dry eye? As mentioned above, seasonal and environmental allergies as well as disorders such as blepharitis and rosacea that affect the eyelids can lead to dry eye. Dry eye can be associated with dry mouth as well as many auto-inflammatory disorders, such as rheumatoid arthritis or systemic lupus erythematosus – this is known as Sjögren’s syndrome. Thyroid disease is also a major cause of dry eye. What are complications of dry eyes? Dry eyes most often result in continuous irritation for the patient, which in itself is not an ocular complication, but can cause incredible frustration and changes in lifestyle. When dry eyes become chronic or severe, they can cause changes in the ocular surface such as new blood vessel growth, scarring, infection, and even dangerous thinning or frank perforation of the eye. Poor vision can ensue, and at times be irreparable without surgical intervention. After a proper medical history has been taken, a series of clinical evaluations can be performed to assess the extent of dryness and what may be causing it – at times there may be 5 or 6 reasons why a patient has ocular dryness. Slit lamp examination can reveal changes on the cornea showing evidence of dryness, or dysfunction of eyelid anatomy, though sometimes there is no abnormality found on exam to explain the extent of symptoms a patient may have. A Schirmer’s test uses paper strips to quantify how much tearing a person is capable of. 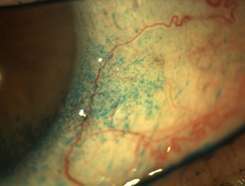 Several stains of the ocular surface are used to detect unhealthy cells and areas of compromise. There are some tests available which check the components of a patient’s tears. Blood work is sometimes done when a systemic disorder is suspected. Lubrication with artificial tears on a daily basis is the most recommended way to treat dry eye, however there are several other things a patient may do to help themselves. Lifestyle modifications are the first of these, including home humidification and avoidance of high ventilation, especially in sleeping areas, which can improve the living environment. Diet modification to incorporate omega-3 fatty acids can help tear composition. Use of warm compresses and vertical massage technique to the eyelids twice daily can help increase the flow of oils from glands in the eyelids, which can lead to tears that better coat the eye and keep it healthy. Plugs can be placed in the tear ducts to keep tears from exiting the environment too quickly. 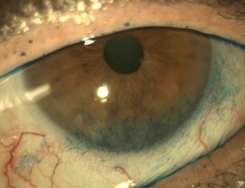 Special “scleral” contact lenses can sometimes be used to retain liquid near the ocular surface. Occasionally surgery is done to improve the eyelids’ ability to close properly. Medications can also play a role in treatment of dry eye. Aside from topical lubricants, which include eye drops, gels, or ointments, anti-inflammatory and immunomodulatory drops such as a weak corticosteroid (Alrex) or cyclosporine (Restasis) can be effective. Treatment of systemic disease can also be very important to limiting the underlying driving force for dryness.